BRAMPTON, ONTARIO— The Brampton Beast, the ECHL affiliate of the Montreal Canadiens, are very pleased to team up with longstanding Brampton manufacturing business Velcro Canada Inc. to present the #HookedOnReading Challenge. This endeavour is being established in order to get students attending schools in the Peel Region to get enthusiastic about reading and to raise awareness about why it is important to take the time to read books. Velcro Companies has deep roots in Ontario. The company has been making its world renowned hook-and-loop fasteners in Brampton for more than 50 years and recently expanded its manufacturing facility to meet growing North American demand. 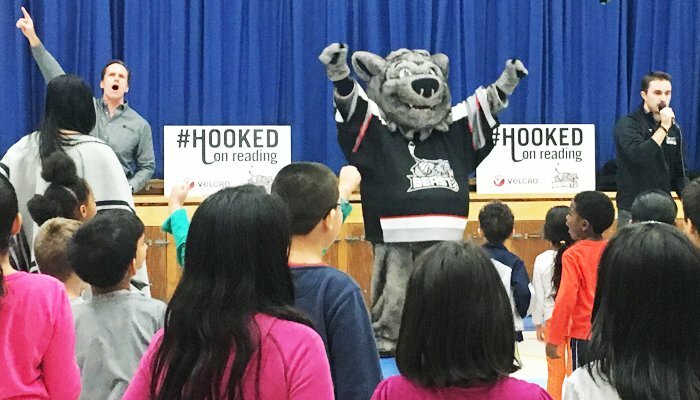 Students who show initiative by reading two books outside of the regular school curriculum will be rewarded by Velcro Companies with tickets to the Brampton Beast’s game against the Florida Everblades on Sunday, February 26 at the Powerade Centre starting at 3 p.m. The Beast and Velcro Companies are pleased to announce that Madoc Drive Public School, Lancaster Public School and Springbrook Public School have signed on to participate in this challenge. In addition to the students having an opportunity to earn Beast tickets, they will get the chance to converse with Brampton Beast players about reading, and have Beast players read to them at their school throughout the six weeks leading up to the Velcro Companies game! To find out more about Brampton Beast school programs, please contact Matt O’Reilly at moreilly@bramptonbeast.com or 905-564-1684 x200. To find out more about Velcro Canada Inc. please visit Velcro.com.